"Dr. Paola Escobar and the staff always go above and beyond." "Office staff is friendly and professional." "Patient, kind and allowed us to fulfill our birth plan with flexibility." At Holistic OB/GYN & Midwifery in Clifton, New Jersey, Paola A. Escobar, MSN, MBA-HCM, CNM, and her team of experienced and certified midwives offers expert gynecology and OB/GYN services to women of all ages. Paola and her team build lasting relationships with their clients and provide a holistic approach to health, aiming to improve total wellness instead of just focusing on symptoms. 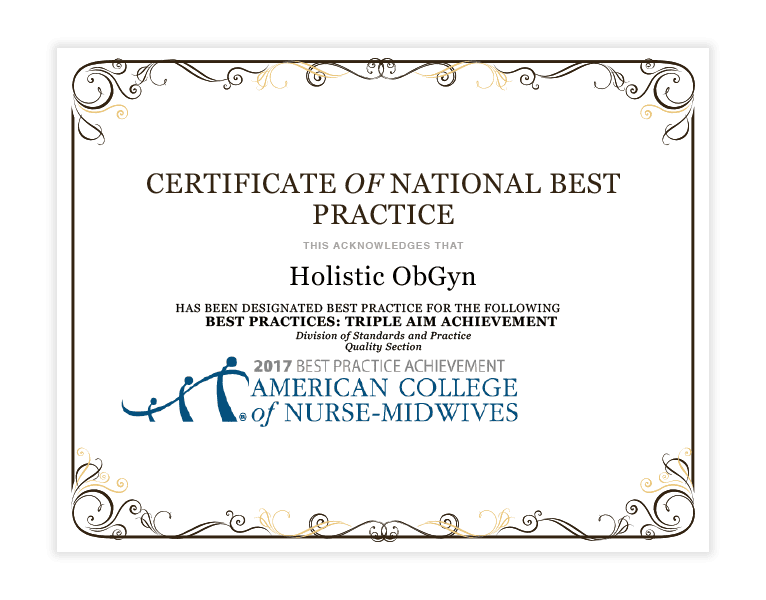 Holistic OB/GYN & Midwifery provides a comfortable and compassionate environment for women to receive expert care before, during, and after pregnancy. The team works with each patient to provide the pregnancy and birth experience they want. All deliveries are scheduled at Hackensack University Medical Center at Pascack Valley in Westwood, New Jersey, or St. Mary’s General Hospital in Passaic, New Jersey. In addition to your midwife from Holistic OB/GYN, Dr. Charles Haddad, MD, FACOG, is available for consultations for high-risk pregnancies and deliveries. The practice also collaboares with Perinatologist Dr. Aldo Khoury for high-risk pregnancies. The team of midwives at Holistic OB/GYN & Midwifery provide a comprehensive range of women’s health and gynecological services including well-woman exams, Pap smears, birth control, menopause management, and infertility consultations. Holistic OB/GYN & Midwifery welcomes new patients and accepts most insurance plans. To schedule an appointment, call the practice or use the online booking tool. At Holistic Ob/Gyn we focus on treating the women during all phases of their lives. Primary care, gynecologic and family planning services, preconception care, care during pregnancy, childbirth and the postpartum period, care of the normal newborn during the first 28 days of life, and treatment of male partners for sexually transmitted infections. Midwives provide initial and ongoing comprehensive assessment, diagnosis and treatment. Midwives are also authorized to admit, manage and discharge patients as wells as order and interpret laboratory and diagnostic tests and order the use of medical devices. One of the most important aspects of our model of care includes your health promotion, disease prevention along with individualized wellness education and counseling. Holistic OB/GYN & Midwifery accepts many insurance providers. If you do not see your provider listed here please reach out to our office! Like tiptoeing children who should be asleep in their beds, crow’s feet and frown lines have a way of sneaking up on you when you least expect them. Make lines and wrinkles quickly and safely vanish with Botox® — the leading treatment of its kind. Does coughing or sneezing cause a urine leak? Do you always scope out the nearest bathroom for sudden urges? Is this impacting your social life? If so, you may be suffering from urinary incontinence. Read on to learn its causes and treatments. The good news? You don’t have to give up on the possibility of a vaginal birth after having a cesarean section. Hear from the experts about what you should consider as you decide whether to have a VBAC. "We were greeted by very warm and friendly staff. The delivery was beautiful, natural and more than we expected." "Paola Escobar's passion and dedication to knowledge and true care of a pregnant and laboring woman is second to none. I felt empowered, safe, and listened to." "Paola Escobar was very kindhearted, answered all my questions, and explained everything with patience. The delivery experience was everything I had hoped for and more."